The restorative approach seeks to address harm to victims, while weighing the circumstances and life of the offender. Restorative justice is an important piece of this puzzle. Rooted in the indigenous Maori justice process in New Zealand and in Native American dispute resolution practices, restorative justice has proven useful in California juvenile, civil, and even criminal cases. Research shows that restorative justice can cut down re-offending by more than 80%. But in addition to reducing recidivism, restorative justice seeks to heal all involved, addressing harm to victims, while weighing the circumstances and life of the offender. The process often involves two main components: a meeting (mediation or group conference) and reparation of harm to all affected (restoration). Retired Santa Clara County Judge Leonard Edwards is an advisor to the Judicial Council and has advocated for restorative justice during his 20 years in juvenile court. One form of restorative justice is now used in California’s 75 peer courts-also called teen or youth courts. Students are sentenced to engage in community service, write letters of apology, and take part in programs such as counseling or alcohol treatment. According to advocates, programs like this not only help to disrupt the “school-to-prison” pipeline by keeping kids out of juvenile court, they also strengthen a student’s understanding of the justice system. The Keeping Kids in School Initiative (KKIS) maintains that helping young people understand the role the courts play in their lives is an important step in ensuring they do not end up permanently involved in the justice system. Restorative justice is an important tenet of KKIS, as well as California Chief Justice Tani Cantil-Sakauye’s Civic Learning Initiative, launched in 2011 to recognize state public schools for their efforts to engage students in civic learning. Recent research shows that restorative justice complements civic education in our schools. Although restorative justice originated in the justice system, in recent years, school districts in California and nationwide have increasingly relied on restorative justice practices to address problematic behavior on K-12 campuses. In a school setting, restorative justice often takes the form of conflict mediation or restorative circles—in which all parties sit in a circle and share their experiences uninterrupted. Schools also use one-on-one and community meetings that encourage students to reflect on the impacts of harmful behaviors. In 2010, the Oakland School Board passed a resolution adopting restorative justice as a system-wide alternative to strict zero-tolerance discipline. The schools that implemented restorative practices saw a 40% decline in suspensions for black students within a year, creating stronger and healthier school communities. “This is an example of how we can not only do healing on interpersonal levels in our lives, but how we can create systems that are more healing and policies that are more healing. I think it’s important to do both,” Fania Davis stated. Davis is the co-founder and director of Restorative Justice for Oakland Youth (RJOY), and a national thought leader in the field of restorative justice. Balanced and Restorative Justice Philosophy, a foundational element of restorative juvenile justice practice, recognizes that successful restorative justice requires commitment and patience from all involved—schools, communities and the courts. 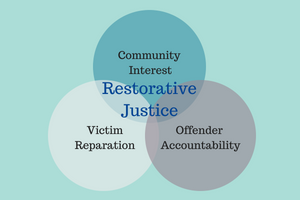 Proponents say restorative justice demands a systematic commitment to finding new ways to heal holistically within our institutions. At its core, restorative justice is about meeting the needs of people who are hurt and helping them heal in a way that benefits not only the people involved, but also their communities and broader society.